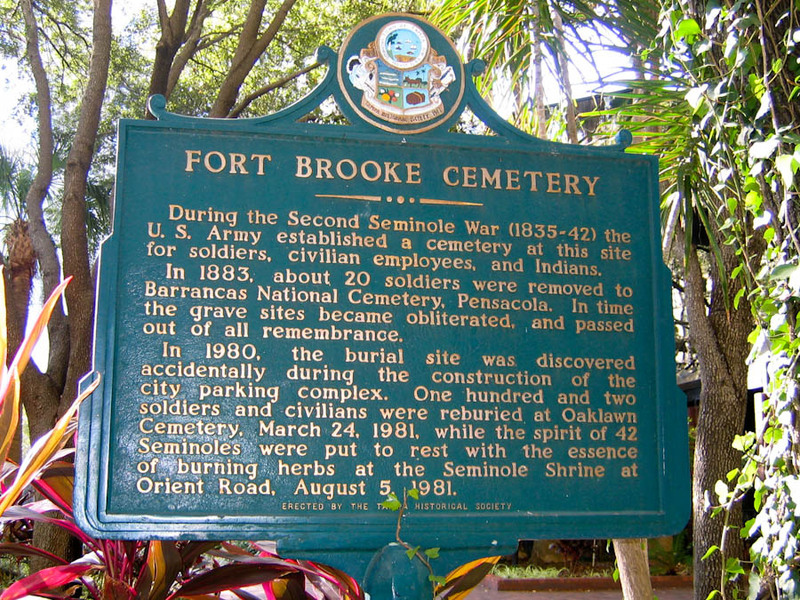 As the center of U.S. Army power during the Seminole Wars starting in 1824, Fort Brooke was the one of the first military bases established in the recently-acquired Florida Territory. The fort also faced naval bombardment during the Civil War by Northern forces. 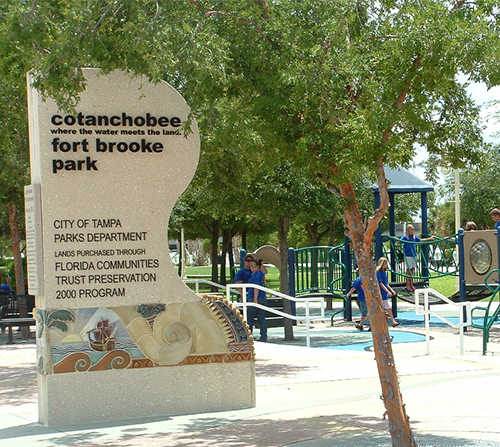 Today, Cotanchobee Fort Brooke Park provides a picturesque Downtown Tampa green space that pays tribute to this Tampa history, linking the city to indigenous peoples of the past. That past came together in December 2012 when Tampa bronze sculptor Steven Dickey and the Historical Monument Trail Committee installed six bronze busts of Tampa trailblazers along the two-mile stretch of the downtown Riverwalk, including a “surprise” according to an August 2012 article in the Tampa Bay Times. 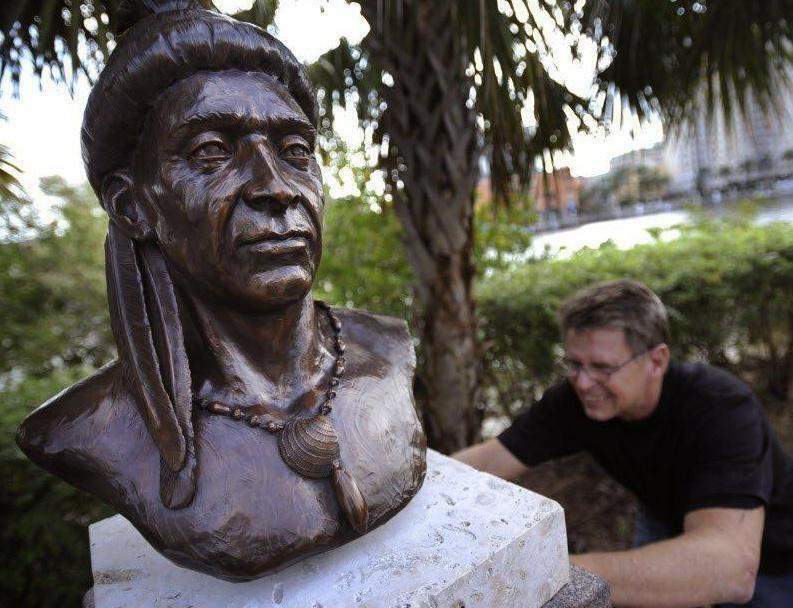 The bust chosen for Cotanchobee Fort Brooke Park - located at 601 Water Street - was an adult male representative of the Mound Builder indigenous tribes, the “First Floridians”, that inhabited the area over 10,000 years ago. This was a was a surprise because the other bronze statues along the Riverwalk Historical Path are individual trailblazers of commerce, civil rights, entrepreneurialism. 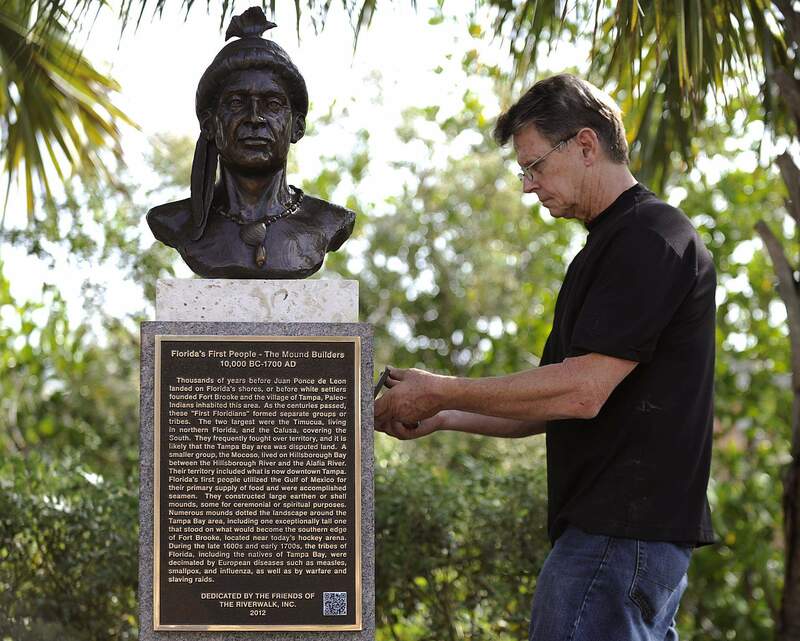 The Mound Builder marker considers the histories of all indigenous peoples of Florida over thousands of years as a backdrop to the comparatively-smaller two centuries of American history in Florida territory. Some of that history is the United States Government’s war against the Seminole Tribe - the Army’s attempt to move these Native Floridians onto reservations and, ultimately, out of Florida territory altogether. After the First Seminole War of 1816-1819, Fort Brooke was built in 1824 to help the U.S. Government implement the Treaty of Moultry Creek by moving of the Seminole Tribe to land to the northwest of Tampa Bay. Eleven years later, Seminole resistance became the Second Seminole War, 1835-1842. The original land scouted by Lt. 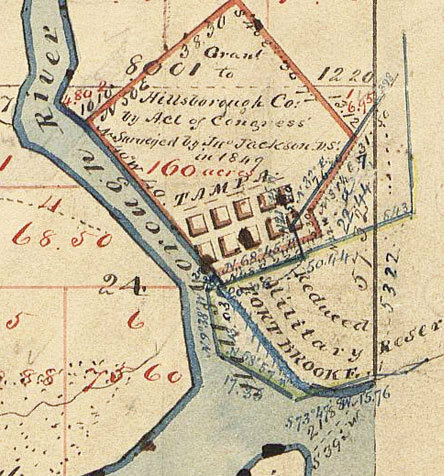 Colonel George Mercer Brooke was located at the mouth of the Hillsborough River and extended east to the current location of the Tampa Bay History Center (TBHC). One of the reasons Brooke suggested the location was its access to Tampa Bay and Hillsborough River. This large tract of premium downtown property now contains Amalie Arena, the TBHC, two convention center hotels, expansive parking, and Cotanchobee Fort Brooke Park. Brooke saw the same thing almost two hundred years ago that developers saw today: with easy access to the Gulf of Mexico, the land Fort Brooke sat on was the perfect location for maritime commerce. Fort Brooke was also active during the American Civil War and was attacked on two different occasions by Northern forces during the war, the Battle of Fort Brooke (and Battle of Ballast Point) and the fort’s eventual capture on May 6th, 1864 by the Union Navy. On March 27, 1863, the Union gunboat Pursuit sailed into Tampa Bay. Confederate Captain John W. Pearson took some of his men out to the bay and disguised several of his soldiers as African Americans, instructing them to act like they were freed slaves seeking shelter from the Union. While other Confederate soldiers hid in the brush nearby, a number of Union sailors came ashore under a flag of truce to aid the perceived freed slaves. Pearson’s men opened fire on the Union sailors, wounding four. The Federals were outraged and sent the ships Tahoma and Beauregard to bombard Tampa and Fort Brooke, causing little damage. On October 13, 1863, two Federal gunboats, the Adela and Tahoma, arrived in Tampa Bay and began shelling Fort Brooke on October 15. The bombardment lasted all day, and 126 shells were fired at the fort. After several days of bombardment, the Tahoma dropped 140 men at Ballast Point with an objective to burn and sink two Confederate blockade runners, the Scottish Chief and the Kate Dale. Marching overland, the landing party was successful in burning the runners, but they were driven back by a fierce assault by the Confederate forces. Although the Confederate forces were successful at driving the Union saboteurs back, the Union was successful in its mission. Having lost about twenty men each, both sides claim victory at the Battle of Fort Brooke and Battle of Ballast Point. 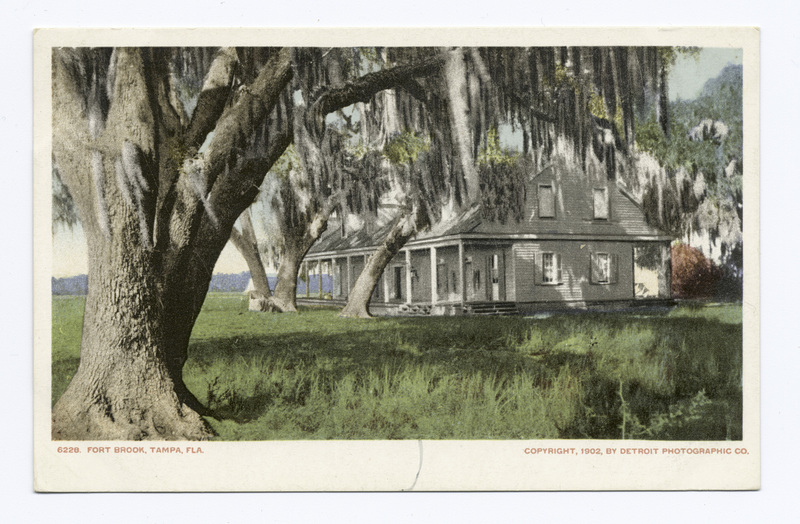 Charles Harris, “Cotanchobee Fort Brooke Park,” Tampa Historical, accessed April 20, 2019, http://tampahistorical.org/items/show/40.